After getting the call that Tristan’s eye was a bit puffy and swollen, I canceled my quiet evening plans (I had recipes all picked out and everything!) 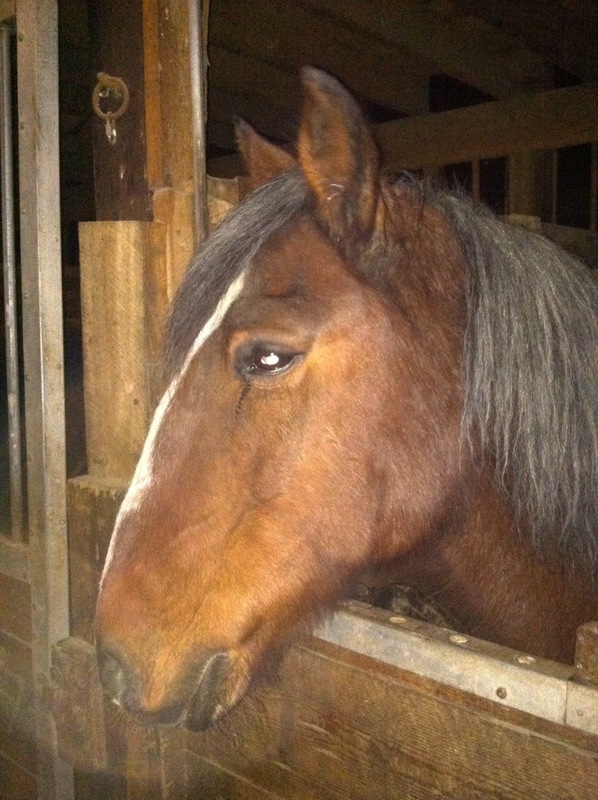 and headed to the barn to check on him. I quickly learned two things. First, his eye really wasn’t bad at all. Though, before we start, I’d like to make something clear. As with any medical situation with a horse, you should know two things. First: know what your horse’s baseline is. That means following Pony Club guidelines and knowing your horse’s average temperature, respiration, heartbeat, and other bodily norms. Pay close attention even when they’re totally fine because that’s how you calibrate your instincts. Second: DO NOT mess around with eye injuries. Don’t. Don’t ever look at your horse’s eye and say “hmmm, that’s definitely weird, but I’ll let it slide for a few days and see what happens.” Many injuries, even bad ones, will hold in stasis for a few days while you observe; eyes can go south in a matter of hours and you do not want that on your conscience. I am making a judgment call about not scheduling the vet because I have nearly a decade of experience with this horse and the things he does. I have treated a wide variety of eye problems with him specifically, and I have both a very good baseline and a clear timeline of progression. If his eye gets worse in any way, the vet will be out faster than you could finish reading this post. Okay? Okay. On to the pictures. A little puffy, a little weepy. He was acting totally normal, and blinking a hair more rapidly with his left eye than with his right when I moved my hand near it. The white you see is the reflection of the flash – there was no cloudiness or other abnormality in person. The tears coming out were clear and thin and draining easily. For comparison. He’s alert, which means both his eyes are open and looking at me as much as they are capable of. You can see that his left eye is a bit squintier than his right, and you can see the track of the discharge from his left eye. But you can also see that it’s really not that far off normal. The barn will keep an eye on him today, and if he’s basically back to normal per their observation then I won’t go out tonight. If there’s any remaining puffiness I’ll head out and triple-check, and tomorrow morning will probably be our make-or-break for the vet. Based on his usual modus operandi, though, I strongly suspect it will be 99% cleared up by the end of the day today. 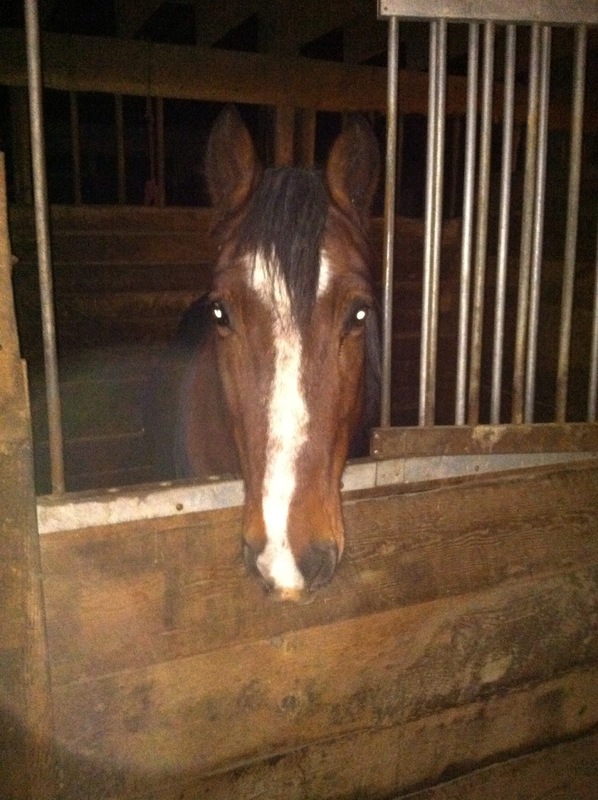 The second thing that I learned at the barn last night was that I was totally right to have decided against working him. 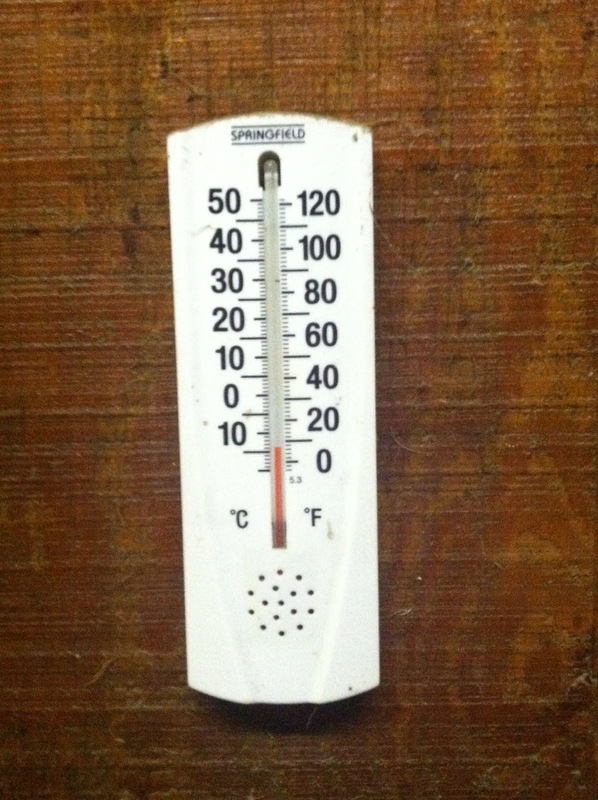 About 7 degrees per this thermometer, which is a) inside the barn and b) on the outside wall of the heated tack room. So that should tell you something about actual outside temperatures!